As most of my friends can attest, I am very big on making backups of my DVDs, so much so that I rarely pull them out of their case except to make rips of them. I tend to break/scratch discs like none other, so I make it a point to have backups. I am very hard to please when it comes to ripping programs, as I both want to be able to tweak advanced settings to my liking, but also to just be able to throw something in and go. Needless to say, I want the rips to be high quality. I generally use x264 video and AC3 audio muxed into an MKV container, and I've found this to be a very good combination. I have tried pretty much every tool that I can find out there to do this for me: dvd::rip, OGMRip, and acidrip to name a few, but have still always fallen back to using a collection of custom CLI scripts that I put together to rip and encode them automatically. I've even toyed around with the idea of creating my own GUI, to attempt to fill a rather gaping void of decent ripping programs, but unfortunately not had the time. Thankfully, this will no longer be necessary. I have just tested the latest Handbrake release for Linux, and I have to say, these guys have outdone themselves. When I last tried Handbrake, it was simply a CLI version on Linux, and a rather bad one at that. My direct mencoder invocations consistently performed better than their command line program's calls, a reason alone to move on. Beyond that, it was just hard to use, and if I was doing command line, I might as well just use mencoder. Not so anymore with the release of their latest GUI. 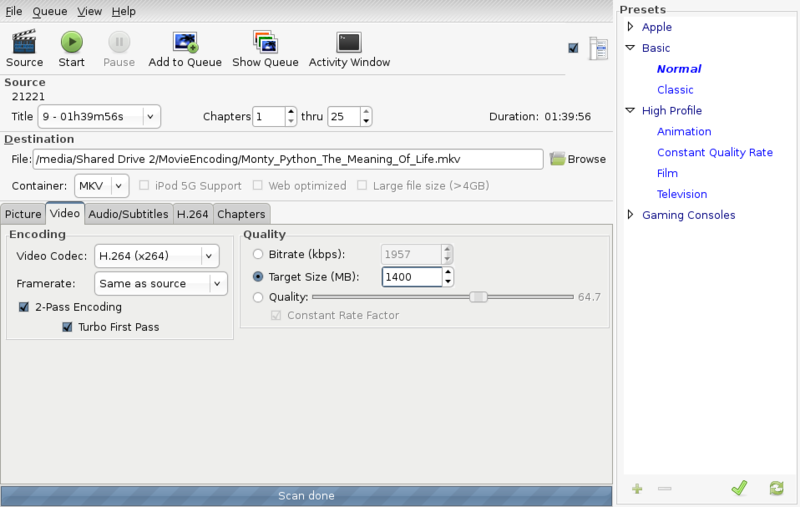 It's a GTK frontend, which really does make encoding as simple as point and click. Now Handbrake has long been a favorite on Windows, so this may not come as a surprise to some, but I really was not expecting this kind of release for Linux from them. Kudos. Now, you need to copy the lines below into it. If you are on Intrepid, change "hardy" to "intrepid". As you can see, the GUI is laid out pretty simply. A number of pre-made profiles are there for your convenience on the right side, with profiles for everything from iPods to movies to Xbox 360s. To begin your rip, insert a DVD. Click the Source button and just select the DVD drive that you've put the disc into. Check to make sure that the correct title that you want was selected, there should be a preview at the bottom. It seems to just select the longest title available. If it is not the one you want, simply select what title/chapters you wish to rip to your file. If you want to rip something such as a TV show season (meaning you want seperate files for each episode), you will need to add each title to the queue individually AFAIK. Choose where you want to save this file. Then, select the file container you want. I personally would recommend the MKV format, as an open source and completely free container, but depending on what you are using your rip for you may not be able to do this. Regardless, there are plenty of options for your container. All that's left now is to change the video/audio encoding settings to your liking. You can essentially configure this as much or as little as you'd like to. If you want subtitles included, make sure that the proper ones are selected in the Audio/Subtitles tab. For me, making rips of DVDs is perfectly managed by the High Profile -> Film profile, with a few small tweaks. One thing I would recommend doing is setting your bitrate/final file size in the video tab. I usually go for a 1.4GB file when using h.264 + AC3 5.1 , but again, I go for high quality, you would be perfectly fine going with something lower. Once you've configured everything to your liking, just click Start. If you want to add other movies, click Add To Queue, but do remember that you can only have one DVD in your drive at a time. I hope this was helpful to someone out there struggling with encoding DVDs on Linux. If there are any errors in the above post, or anything you would like my to expand upon, feel free to let me know, I would be glad to help out anyone who's having trouble. If you are having problems, this forum discussion (ubuntuforums.org) might be of help as well. UPDATE: I have now also posted a guide on how to restore these rips to DVDs. Hope it's useful.